It is compact and easy to disassemble. LG 2020 is the solution able to meet all the needs for mobility domenstica. Due to its weight estramente lightweight and compact size allows for easy manoeuveravility in tight spaces. It is strong and durable with an automomy that is second to none. 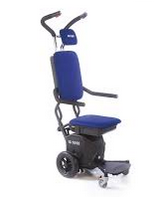 The new and exclusive upward movement makes the lift wheel best and fastest available today. The new rear support allows a climb assisted effortless and comfortable, as well as adjustable to the different heights of the step increasing the security and stability without the need to seek the point of equilibrium. It is compact and easy to disassemble. It is equipped with disengaged safety brakes to move easily and automatically activated, ergonomic handles with large buttons for easy and safe control of the stairlift, adjustable armrests for easy seating, adjustable brake for optiman adaptation to all types of stairs.